Dartmoor is visible from almost everywhere in South Devon. A means of escape exists in dense woods and secret coves and valleys but the moor will always win in the end. Certainly, the spell is not instant. The contours of tors can take weeks or even months to apply their alluring charms and pull you in. Then one day you look out on a familiar landscape and feel the need to fulfill its promise; to be part of something wider. Recently we have neglected the moor in favour of other habitats. And so one fine Tuesday morning in June, we sought to make amends. Dartmoor National Park conjures many notions and ideas: of different places for different people. 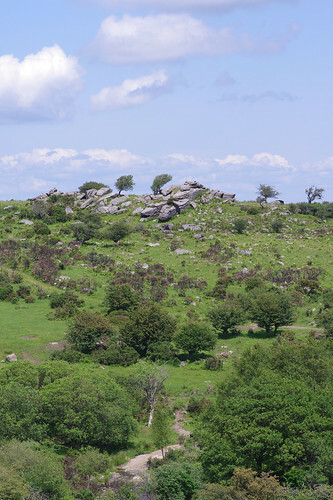 There is the Dartmoor of tourist hotspots in high season, where streams of cars spill into car parks, their occupants file out, take a turn uphill or along river and then leave. There are the villages scattered around the perimeter and the narrow lanes which link them. There is the Dartmoor of many rivers and the compulsion to follow each one upstream all the way to the source. There is the prospect of going knee-deep in poorly-drained and peaty soils, between outcrops and on to the range and the blasted heath when permitted; of tiptoeing around treacherous mires and treading a well-worn path that peters out within ten paces. However many square miles you wander through, there is the sense of a living, breathing place; of the bewildering and unknowable. A map and compass is no guarantee of reaching your destination. The moor demands respect. You could spend a lifetime (as William Crossing did a century ago) immersing yourself in its every corner and still be bowled over by wonders and mysteries on a daily basis. We passed the honey pot of Haytor, continued on the road for a mile or so and pulled in at a smaller car park near Saddle Tor. Despite having the relevant area of the map folded in readiness before we left, I still could not decide on a route and had to improvise. 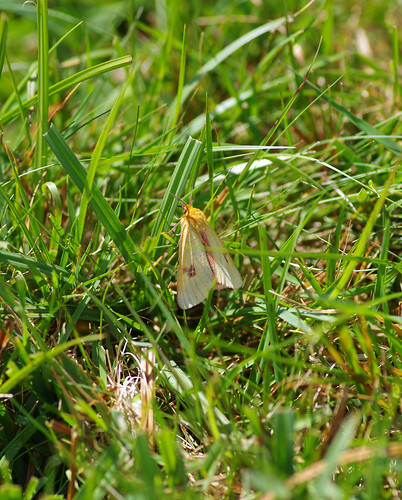 We had barely crossed the road from the car park, when we saw this moth among the grasses. Clouded Buffs are a common species but I don't remember seeing one before. This one did not stand on ceremony and Sherry managed to grab just the one shot before it flew off. I surveyed the slightly boggy tract ahead, thinking it looked manageable enough when the first distraction took us off route. On our walks, a straight line frequently becomes an unbroken length of string to coil or unwind at will, particularly when either of us have a hunch about finding something we have not recorded before. 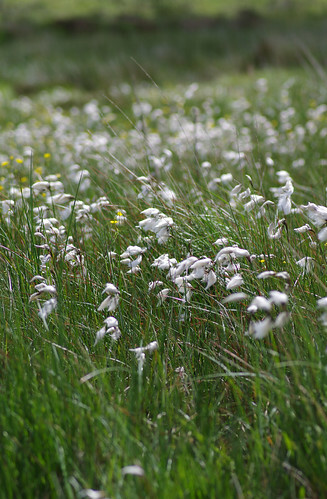 Cottongrass colonises boggy and marshy areas. 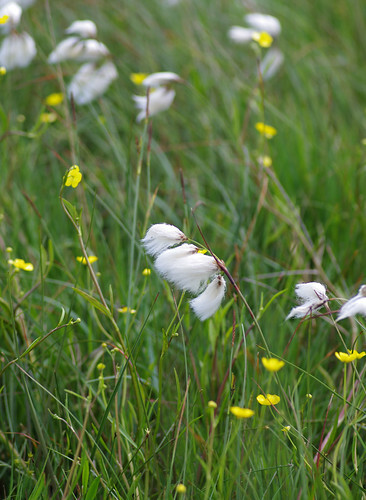 To see these fluffy heads blowing in the breeze is one of the iconic Dartmoor sights of summer. Naturally, we had to get in closer to ascertain the exact species, while exercising the utmost caution with every step. Cotton grasses are members of the sedge family. The formation of the grass heads and the red-tinged stems mark the one above as the common variety. The yellow flowers in the picture above are Lesser Spearworts. We kept to the edge and rather than cross, elected to go round one stream and then around a second. It's not worth taking short-cuts when there's an element of risk involved. In any case, our patience was soon rewarded beyond our wildest expectations. There are not many breeding pairs of curlews left on the moor. I have never seen them on Dartmoor before and found it hard to believe when not one but two birds flew above and around us, with their characteristically long curved bills and haunting cries. Curlews are ground-nesting birds and one reason given for their decline is disturbance by humans, dogs and possibly increassed predation of eggs and young by foxes. 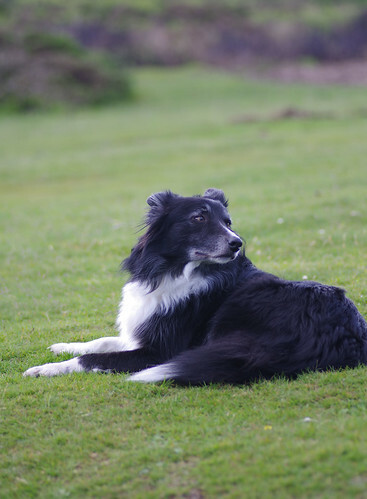 Lady was reigned in on the lead and we quickly found a path above the probable nesting area. But the most surprising thing about where the curlews had made their home was the site's proximity to Hay Tor, one of the moor's busiest places. Looking up to its granite top, perhaps a party of twenty or thirty were stood on the outcrop. We continued past the curlews, heading in a roughly southerly direction towards Bag Tor. Away from their territory, there were more watery margins to explore. 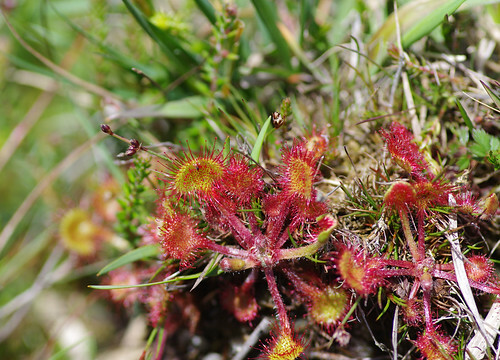 Sundews are specialists of acid, peaty soils and insectivorous to boot. Their red sticky tentacles trap flies and they are able to take nourishment and survive. Later in the season, each plant will produce a white flower on a long stalk. Last year, while on holiday, I went on a mad, solo stomp around the moor. Ten hours later, I hobbled back to the cottage with the blisters to prove it, regretting that I had gone so far, so fast. The highlight of my mad trek was worth it, though. I had not just seen a Green Hairstreak butterfly, but had one sit on my thumb. The fact that such a tiny creature had put its trust in me was incredibly moving. 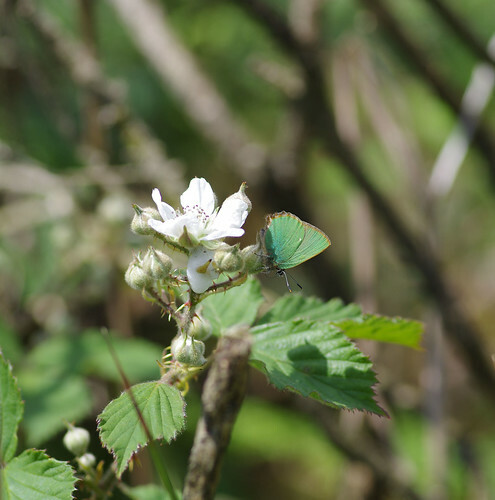 I had only seen a Green Hairstreak once before and it had been gone in a flash. Sherry was quietly envious and has been itching to see one ever since. Naturally, she could hardly contain her excitement as this specimen came into view and played a teasing game of 'can't catch me' around the brambles. Meanwhile, after seeing louseworts among the sphagnum mosses in the ground, I edged out to get a closer shot of the larger, daker-leaved, darker-flowered Marsh Lousewort. If ever there was a time for a telescopic lens it was now, and unfortunately we only had the macro. I spent so much of my effort trying to keep my balance, I forgot about keeping the camera steady. Played back on the screen, every shot had my trademark wobble. With the boot-sized tussocks I had to be precise and when the area between them started to fluctuate - like a magic carpet with ambitions of becoming a water bed. On the way back, one squelchy foot missed, and as I jumped to safety, the black creature below emerged from its mossy lagoon. Could this possibly be a medicinal leech? It looks remarkably similar to one. 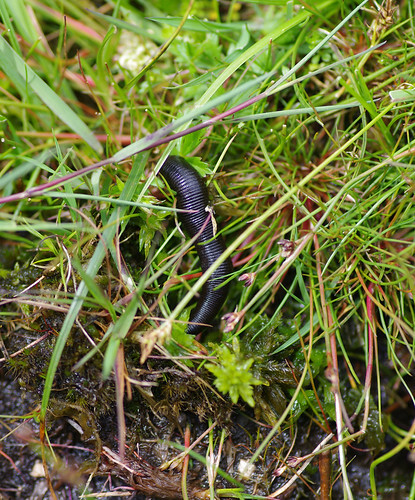 Horse leeches are often found on Dartmoor, but they are brown and not as multi-segmented. I wish I had have taken a closer look. We left the boggy parts behind and passed jellied-orange fungi on the woody branches of gorse bushes and proceeded up to ground that had been grazed. 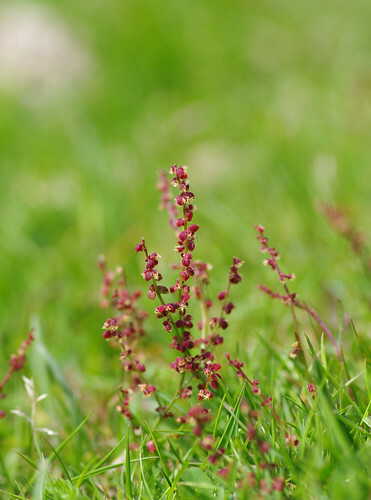 This sorrel can give distant hillsides a striking effect in summer. Sat atop Bag Tor, we had our lunch and enjoyed the views in every direction. The route back to the car looked simple enough and for once, appearances were not deceptive. We followed a track of sorts down to a crystal-clear stream, where the Lady cooled her pads. 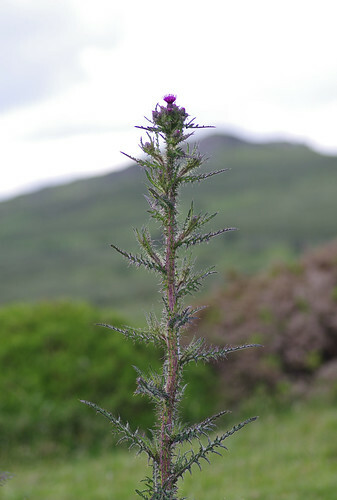 On the way down to the stream we saw this impressive marsh thistle. Unlike many other species, marsh thistles are unbranched. They can be up to two metres in height and this one looked suitably impressive with the hills and sky in the background. 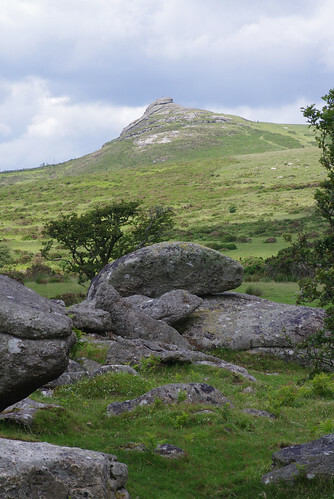 In the top picture, granite boulders provide the foreground and Saddle Tor looms large behind. In the shot above, stunted hawthorn trees bent by the wind cling to life where other trees might not survive. On the way up the dirt track the Lady was kept on the lead. 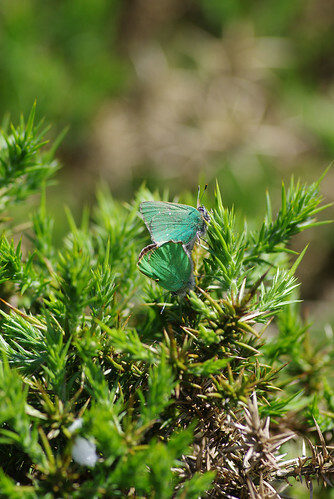 There were lots of sheep and to our mutual delight, almost as many Green Hairstreaks. 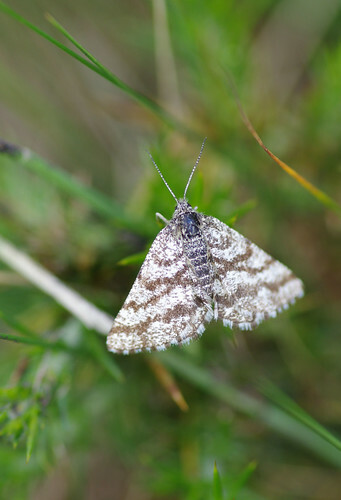 Among the gorse and grasses, we also found this brown moth. The markings are quite distinctive but as yet I have been unable to identify it. At the top of the hill, we walked back along the boundary wall and made for Rippon Tor. After a quick nose around, I spotted the letterbox and stamped my notebook with the unusual seal in the shape of a whale's tail fin and the amusing 'have a whale of a time' underneath. We certainly had enjoyed just that. As we headed back towards the road and a quick scaling of the modest Saddle Tor to freshen our lungs, I only regretted there was not sufficient time for another lap. With the odd deviation thrown in, naturally. NOTE - the distance covered was relatively modest, even allowing for the deviations. From the car park below Saddle Tor, we crossed the road, and walked towards Bagtor Down then went upstream and round to avoid the most boggy bits. Once rounding the stream head, we walked in roughly a southerly direction towards Bag Tor. From Bag Tor we headed south to south east until picking up the clear stream and the dirt track that ran up the hill. Then we walked approximately north east towards Rippon Tor, plotted the point of least resistance back to the road and a stunning view at the top of Saddle Tor. You will need Ordnance Survey Map Outdoor Leisure 28: Dartmoor. The starting grid square at Saddle Tor is 75/76. I would strongly advise taking a compass in case of difficulties, stout footwear and additional clothing in case of bad weather. Please also remember to exercise caution. If it looks too boggy then give it a wide berth.